Rabbi in the second half of the eighteenth century; died at Amsterdam 1781. He resided successively at Adrianople, Bologna, Sofia, and Amsterdam, in which last-named city he officiated as rabbi of the Portuguese community. 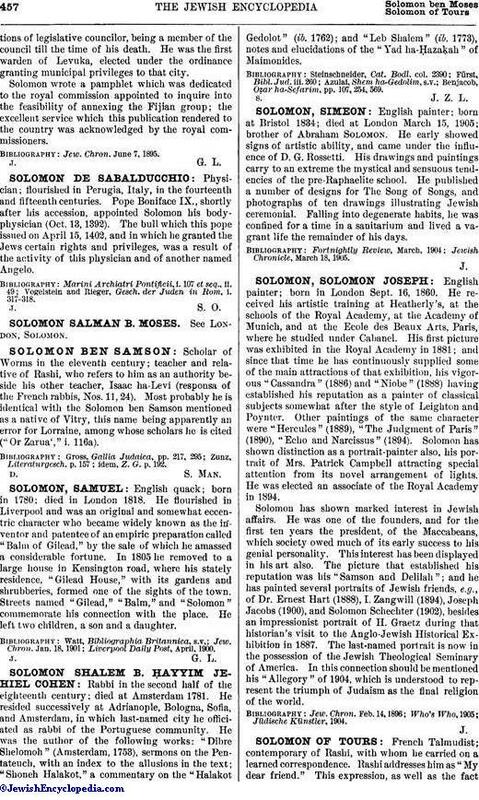 He was the author of the following works: "Dibre Shelomoh" (Amsterdam, 1753), sermons on the Pentateuch, with an index to the allusions in the text; "Shoneh Halakot," a commentary on the "Halakot Gedolot" (ib. 1762); and "Leb Shalem" (ib. 1773), notes and elucidations of the "Yad ha-Ḥazaḳah" of Maimonides. Benjacob, Oẓar ha-Sefarim, pp. 107, 254, 569.